What is the iNaturalist Network? 1. What is the iNaturalist Network? 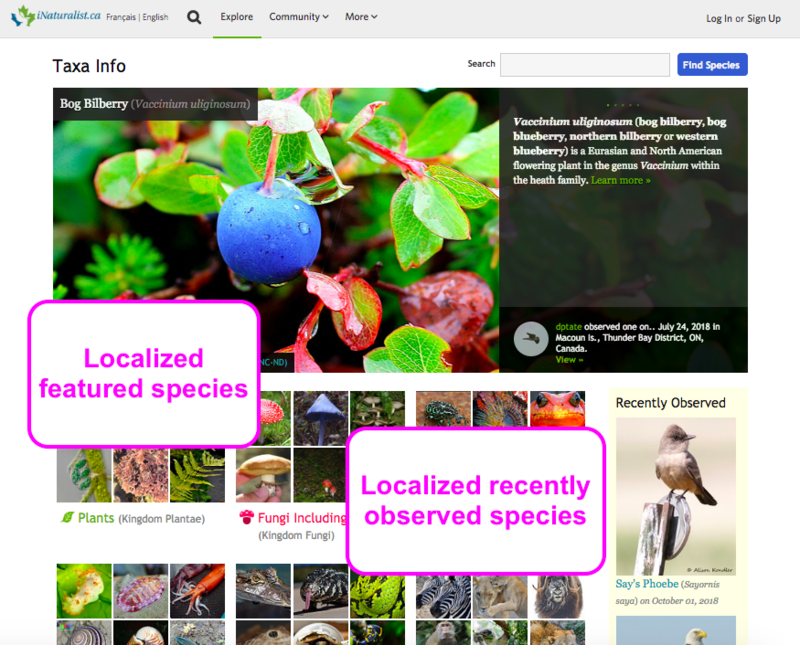 iNaturalist is a global community of naturalists, scientists, and members of the public sharing wildlife sightings to teach one another about the natural world while creating high quality citizen science data for science and conservation. The iNaturalist technology infrastructure and open source software is jointly supported by the California Academy of Sciences and the National Geographic Society. 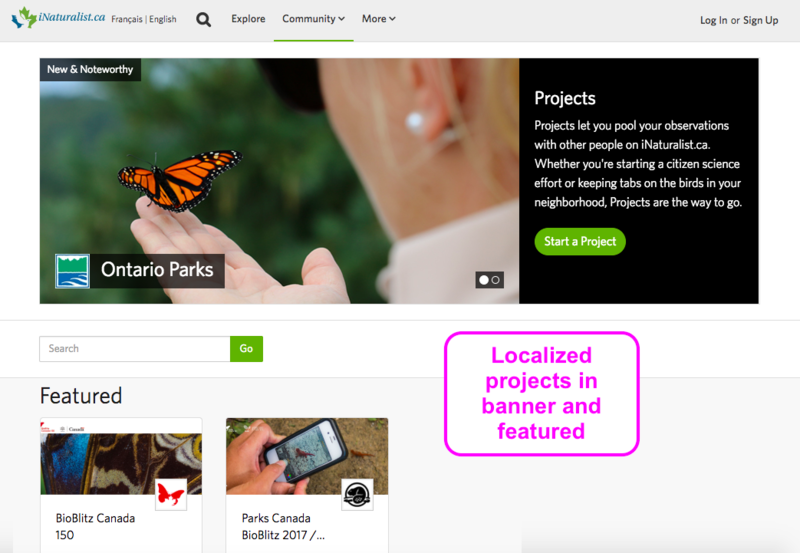 The iNaturalist Network is a framework for localizing the iNaturalist community on national scales. Such national focus can help make nature more accessible in different parts of the world to the public and facilitate the availability of sensitive biodiversity data for regional science and conservation. The Network operates as a series of separate national-scale branded gateways of the iNaturalist software locally configured and led by partner organizations representing their nation. These gateways are connected with shared infrastructure that operates across the network. The Network therefore allows participating members to (1) help provide a biodiversity citizen science experience localized to their host nation and (2) responsibly make sensitive biodiversity data available for national science and conservation, but (3) without fragmenting the global community and scope of the iNaturalist project. 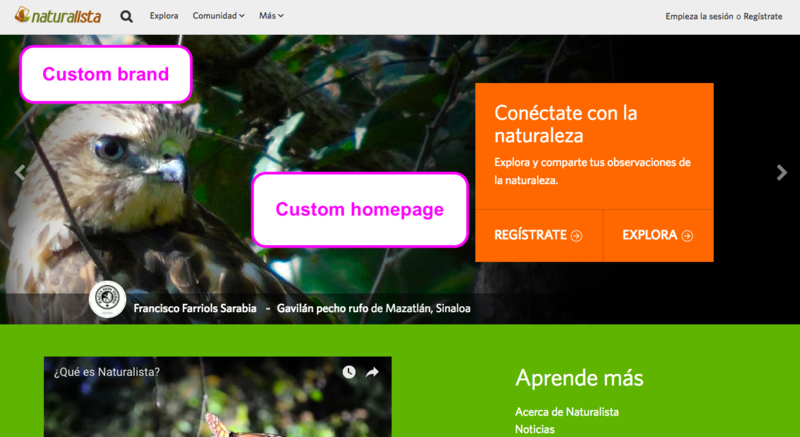 Currently, the iNaturalist Network consists of five members: the iNaturalist Department of the California Academy of Sciences and National Geographic Society operating iNaturalist.org from the United States, the Comisión nacional para el conocimiento y uso de la biodiversidad operating NaturaLista in Mexico, the New Zealand Biodiversity Recording Network operating iNaturalist NZ — Mātaki Taiao (formerly NatureWatch NZ) in New Zealand, the Canadian Wildlife Federation and Royal Ontario Museum operating iNaturalist Canada in Canada, the Instituto Humboldt operating Naturalista in Colombia, Biodiversity4All in Portugal, and MiAmbiente operating Naturalist Panamá . Increasing natural history literacy, understanding, and interest among the public. Generating high-quality biodiversity data for science and conservation. Increasing the excellence and international coverage of the Network through new memberships with effective organizations. Community -- We value community over data generated by the network. If we grow vibrant, local, grassroots communities of naturalists across the globe, then biodiversity monitoring capacity will be an emergent property. But if we focus on generating an archive of biodiversity data while ignoring real people our efforts won’t be sustainable. Open Access -- Our software is open source, data generated by the project is generally visible to the public (with the exception of sensitive species data and private user data), and released under a Creative Commons license by default (though participants can opt-out of such licensing if they choose). Interoperability -- Think locally, act globally. While we make efforts to localize participant’s experiences, we believe that social networks and crowdsourcing efforts benefit from large, connected communities and databases. We strive to build a global community of naturalists and scalable streams of biodiversity data that can contribute to science and policy globally. Presently, this means all network members share one underlying taxonomy that cannot be configured independently for different geographic areas. Is positioned to successfully coordinate iNaturalist activities on a national scale by partnering with relevant national education, research, and governmental institutions. Can carry out the Network Member responsibilities described below. Can participate in the iNaturalist Network Member Committee to steer the development of the iNaturalist Network. If your organization is interested in joining the Network, please review the iNaturalist Network Membership Application and contact us if you have questions. 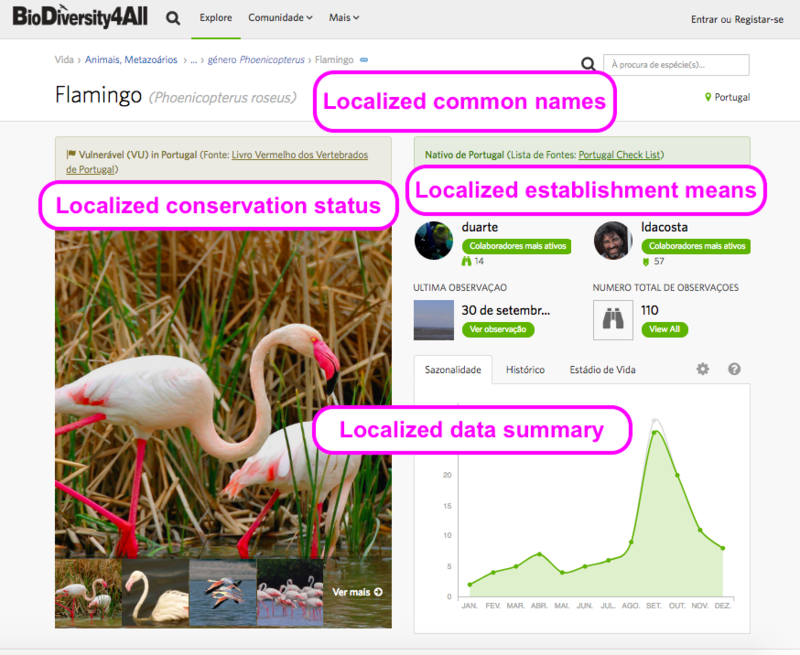 Visibility in the rapidly growing iNaturalist project by coordinating activities within your host nation and associating your organization with the global iNaturalist effort. Access to private data generated through your branded gateway including the locations of sensitive species and participant’s private contact information. Influence in the development of the iNaturalist Network as part of the Membership Committee. 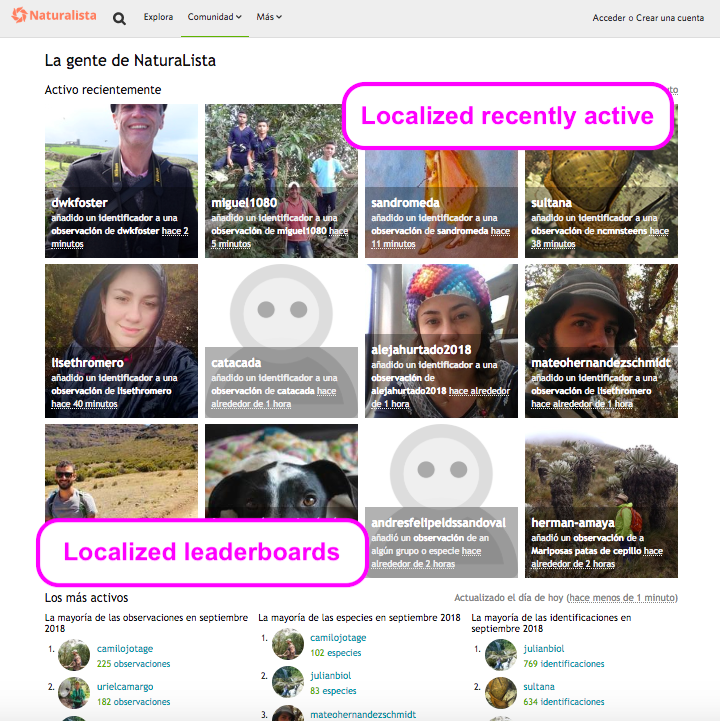 Help grow the number of users, observations, identifications, and species count from within your host nation through active use and promotion of the iNaturalist platform and the coordination of outreach activities. Promote and model community behavior in accordance with the community guidelines. Responsibly steward sensitive data contributed through your gateway while striving to make these data available for national science and conservation. Register and secure a unique domain (e.g. inaturalist.nz, inaturalist.ca, naturalista.mx) in the name of the member organization. In this case, your organization is responsible for registering the domain, obtaining a SSL certificate, paying the fees associated with those registrations, configuring DNS as requested by iNaturalist, and maintaining the registrations (so it doesn't lapse and become unreachable). 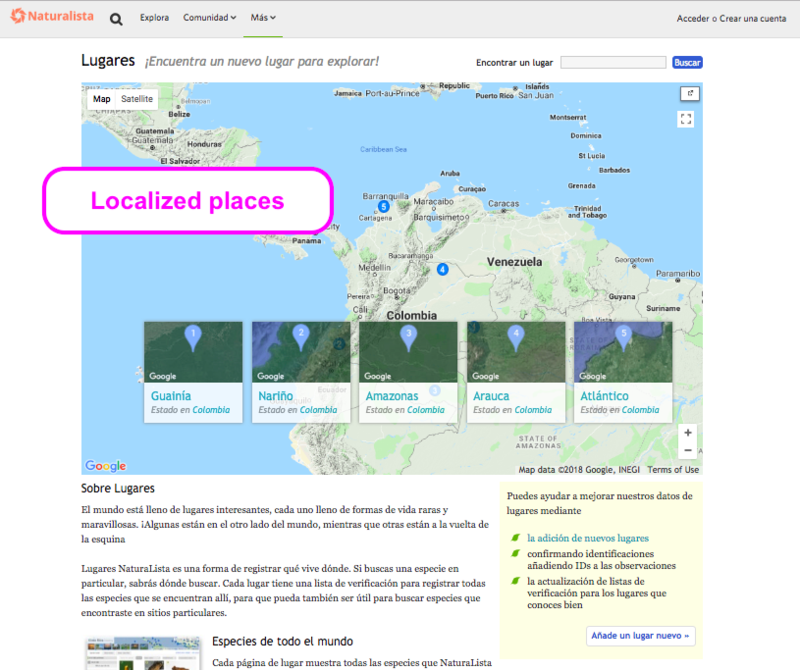 Use a subdomain of iNaturalist (e.g. colombia.inaturalist.org). In this case, iNaturalist assumes all of the responsibilities described above. You can still customize the home page, language, footer links, etc. 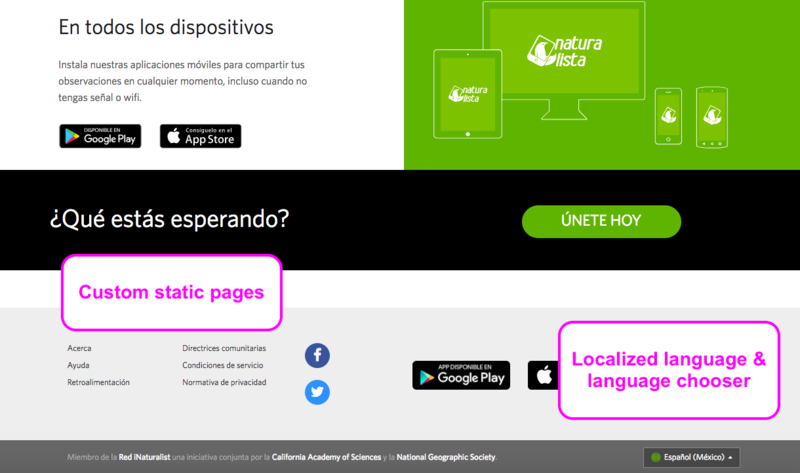 Help maintain and approve the relevant national translation of the iNaturalist software in order to maintain 75% translation for web, iOS, and Android apps. If needed, hire a skilled bi/multilingual developer who can assist with changes needed to the iNaturalist open source software (web, iOS, and Android) for translations from English to work properly. Provide support in the relevant national language through writing and adapting documentation, training a community of fluent curators, and responding to support inquiries (via a google group, facebook page, twitter account, blog etc.) in the relevant national language. Help assess and maintain relevant municipality boundaries. Help assess and maintain relevant protected area boundaries. Help assess and maintain national conservation statuses. Help assess and maintain local common names for organisms in the relevant languages. Help assess and maintain national species checklists including native/introduced status and presence/absence. 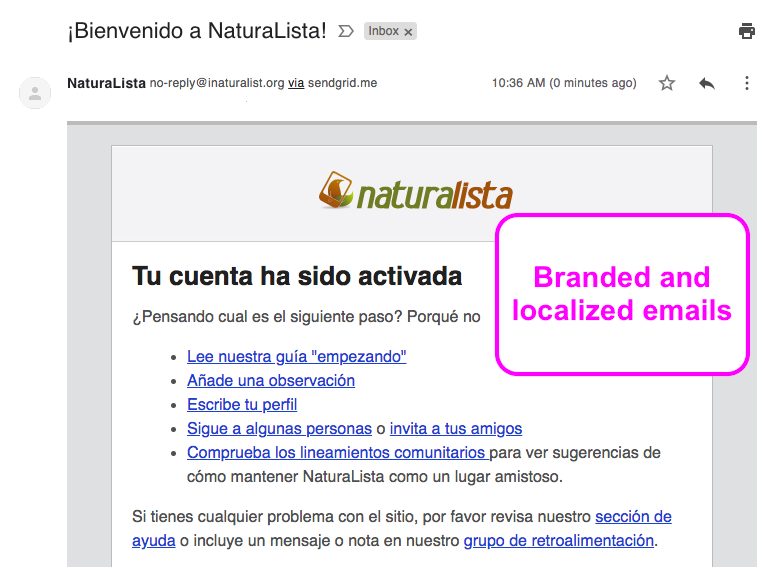 Correspond with iNaturalist Network Members in English. The iNaturalist technology platform consists of a web application, an iPhone application, and an Android application which can each be configured as a national branded gateway. While these platforms are all under active development, their current localization capacity is described here. Future development will continue to seek this balance gateway localization with facilitating interoperability across the network. Each gateway website is configured with custom domains such as naturalista.mx, custom logos, languages, home pages, footers and static pages (about, help, etc.). The network keeps track of the gateway that participants use to sign up. Participants ‘belong’ to the gateway through which they signed up meaning the Network Member is responsible for stewarding the participants' contact information. It is also possible for users to change their affiliation in their account settings. Participants' dashboards and email updates are localized to their gateway accordingly. Pages for browsing observations are localized to filter observations by the spatial extent of the gateway (place filters can easily be removed by the user to search globally). 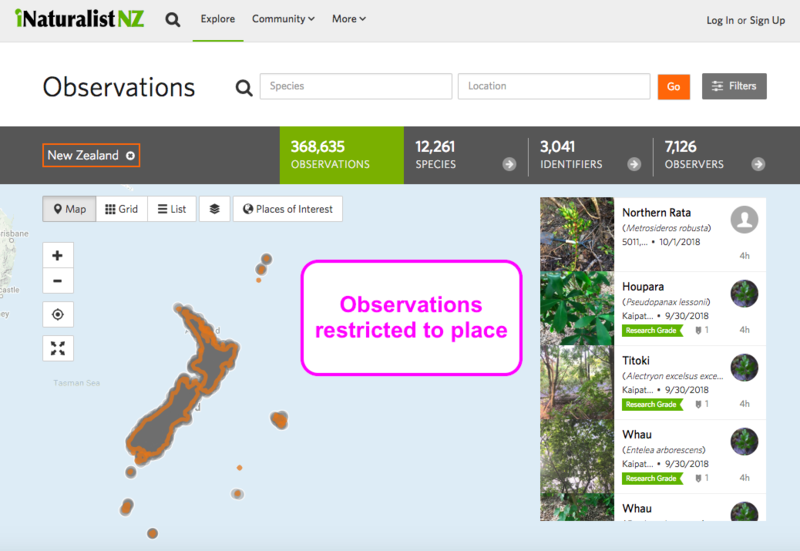 All observations from users affiliated with a gateway are shared with the Network Member, meaning they are responsible for stewarding the sensitive location data for coordinates obscured from public view for either user privacy or protected species. Pages for viewing and searching for organisms are localized to highlight species occurring within the spatial extent of each gateway. This includes local names, the native/introduced status and conservation status of organisms. The project overview page and project search is configured to highlight projects from within the gateway’s spatial extent. The people page and people search is configured to highlight participants belonging to each gateway. The places page and places search are configured highlight places found within the spatial extent of the gateway. The guides overview page is configured to highlight guides from within the gateway’s spatial extent. Because iOS and Android mobile apps must be individually approved when published to the iTunes and Google Play stores, it is impractical to maintain separate mobile apps for each branded gateway. If a Network Member wishes to maintain their own apps they must be responsible for publishing and maintaining their apps. 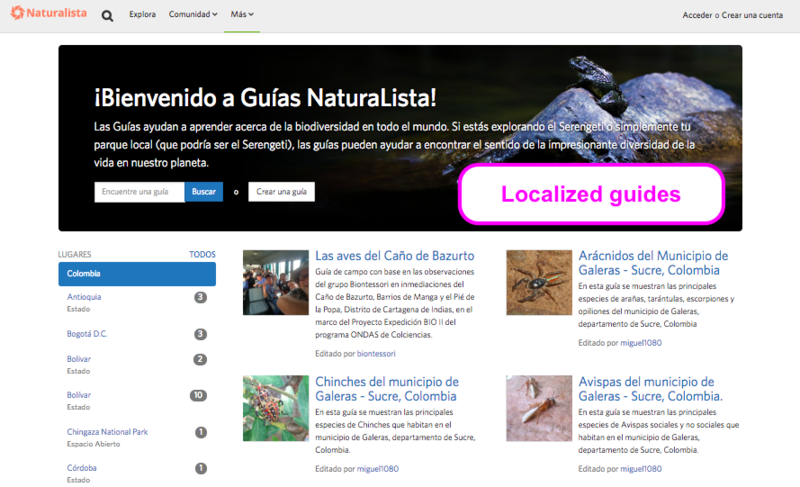 However, the iNaturalist iOS and Android apps have been localized as follows. When the iNaturalist app is launched on a device, the app checks the country in which the device is registered. If the participant is using the app in one of the Network Member nations, they are prompted to localize their app accordingly. Doing so sets the Network setting on the app which localizes the language and other aspects of the app and identifies data posted through the app as belonging to the specific Network Member.